A CIRCLE OF THICK CLOTH MEASURING 40 cm ACROSS (FELT IS A GOOD FABRIC TO USE BECAUSE IT DOESN’T FRAY). PENCIL/PEN. SCISSORS. RULER.GLUE. VELCRO. BEADS. BRAIDING. NUTSHELLS, ETC. FOR DECORATION. circle and put it to one side. Now cut away slightly less than a quarter of your cloth collar. If the cloth starts to fray, turn the edges over and glue them down. side of the collar, the other on the underside. your collar to decorate it. Papier-mâché the tube & leave to dry. Paint the tube gold or brown. 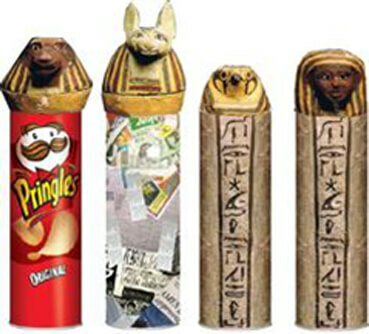 Write your name in the cartouche. Make the head of the Canopic jar out of clay. Mould and Shape the heads, and add ears and eyes, then other facial details. You can make heads of the Egyptian Gods, or simply invent your own four heads. Often the heads of the gods and goddesses wore striped cloths and headdresses. 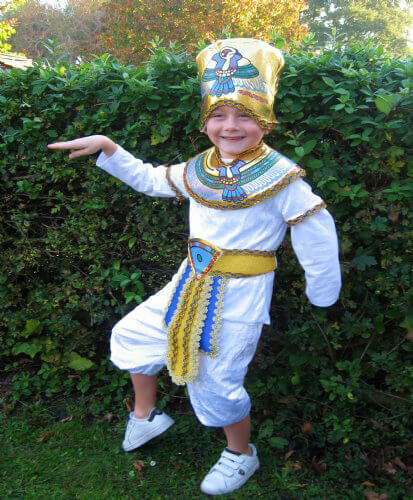 The children assume the role of Egyptian characters and are questioned by the remainder of the class, also in role. 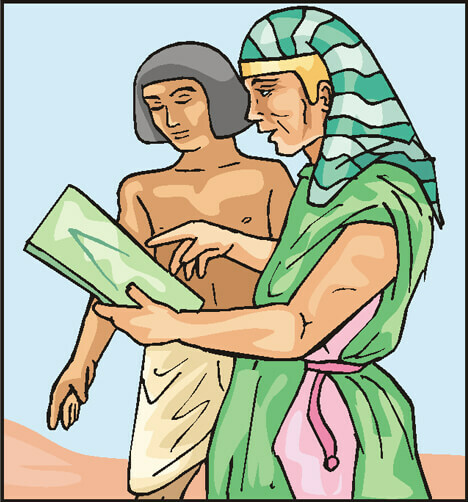 What is it like being a pharaoh? How many pyramids do you have? Are you frightened about losing power? They can ask the questions either as themselves, so their point of view is outside the drama, or they can adopt a role within the drama and ask questions from this perspective. If the class is in role, this helps to focus the kinds of questions asked. This is a useful probing technique which seeks to develop knowledge of the characters’ motives, attitudes and behaviour and increases awareness of the complex nature of human behaviour.